Miss Wonderland might not like hot weather but she has no problems with the rain and the mud after making a triumphant return to the track at Sandown on Saturday. The Snitzel mare had not started since her unplaced effort in the Magic Millions race for three-year-olds on the Gold Coast in January where she was knocked around by the heat, but she found the conditions to suit on a worsening track at Sandown when she rattled home to nose out the hot favourite Sprightly Lass in the Sheen Group Handicap. 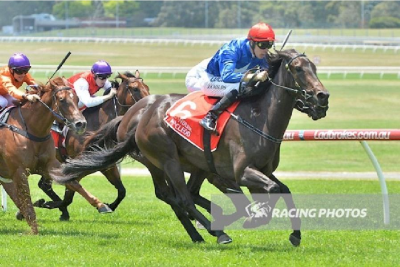 "She was unknown on soft ground but I had trialled her at Mornington in those conditions and so I was pretty confident she'd handle the conditions today," trainer David Brideoake said. Miss Wonderland had originally been trained by Ciaron Maher at Caulfield but made her way to Brideoake's stables at Mornington in an attempt to help her recovery from heat stress. "We've taken our time with her to get her to this stage and there's been plenty of hard work behind the scenes but it is really pleasing to have a mare of this quality up and running and at this time of year as the autumn sprints come up pretty quickly," he said. Ridden by Linda Meech, the mare settled just off the speed but when Sprightly Lass skipped away on turning for home, she looked to be running for second. But Miss Wonderland ($4.80) kept coming and got the $2.10 favourite right on the line to win by a neck with $32 chance For A Song in third place. Miss Wonderland was purchased for $200,000 at the 2015 Magic Millions sale and after just six runs has returned about $155,000 in stakes. More importantly, being a Snitzel mare, she is already stakes placed and Brideoake said he will chase more black type with the mare in the early part of 2018 with a view to hopefully getting the sprinter into a group 1 such as the Oakleigh Plate. The Gold Coast however is unlikely after what happened earlier in the year. "I think she might stay at home," the trainer said. Ladbrokes Park Hillside Race 6 - 2.12.17 from Dalziel Racing on Vimeo. Joe O'Neil and Prime Thoroughbreds seem to have a smart filly on their hands with Edinburgh Park bred Black and Tan (Sebring - A Quiet Shandy). Purchased by Prime Thoroughbreds in the 2016 January Magic Millions Sales , the filly has been patiently brought to hand by John Moloney. The filly accelerated past her rivals in the 1400m 3yo filly's Handicap at Sandown today and the filly will now be sent straight for a spell and be set for the Australasian Oaks in South Australia in the New Year. 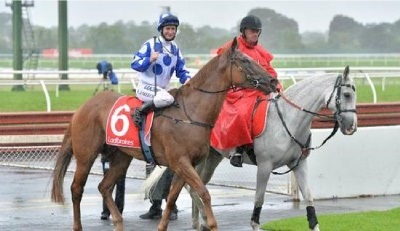 The filly is bred to stay and is on target to go onto better class races in the future. The powerful Darren Weir stable produced an impressive debut winner by So You Think at Warrnambool on Friday. Three year-old colt Tamasa raced up on the pace and cruised home to win the 1200 metre maiden by nearly two lengths in a dominant display. 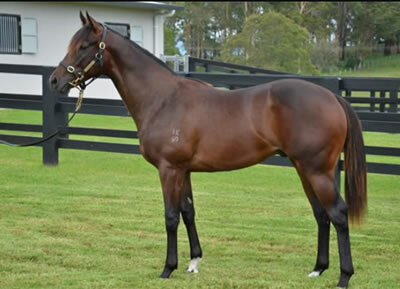 A $160,000 Inglis Classic purchase from the Edinburgh Park draft for part owner G Davies, Tamasa was bred by Ian Smith and is the first foal for Listed Canberra Cup winner Fill the Page. Edinburgh Park sold the second foal of Fill the Page, a colt by The Factor (USA), at Magic Millions this year for $240,000 to Spendthrift Australia. Tamasa brought up a race to race double for Darren Weir and So You Think, with the previous race won by four year-old gelding Billy Bayou. He scored by a length and a half over 2000 metres at his fourth start. Peter and Paul Snowden believe they have a couple of horses of the future after a head separated Assimilate and Dracarys in the ATC Member For A Day 2YO Handicap (1200m) at Randwick on Saturday. Gai Waterhouse and Adrian Bott's Commanding Witness ($3.60 fav) broke well clear in the early stages to set a strong tempo, trailed five lengths away by Chris Waller's Colosimo with Dracarys stalking in behind and Assimilate settling second last. Commanding Witness tired soon after straightening with Dracarys ($5.50) sweeping to the lead at the furlong. Assimilate ($3.90) came off his stablemate's back to edge clear by a head, with a further length back to Chris Waller's Gresham ($5.50) in third. "It was a really good effort," Paul Snowden said, who trains in partnership with his father Peter. "We sent him to Kembla on purpose the other week, he's just very new in himself – he's very raw. "His work before he won at Kembla was very satisfying, it was indicating he was going the right way as far as his mental mindset and he won accordingly, and he's backed it up here with another solid win yet again." "Hopefully they will go all the way," Snowden said. "They keep improving, no doubt Dracarys fits that criteria as does Assimilate. "As we get them up to a little bit further they will certainly come into their own. At the moment they are doing the job, ticking the box and heading the right way." "I would actually like to see him up over 1400m because both starts they have had him off the bit pretty much the whole race," Angland said. "Just the way he let go late was impressive but I think if he could travel into it over 1400m he'll show an even better turn of foot." "The telling factor there was Assimilate had a run under his belt, that's all it is." "Assimilate is probably still six months away, I can see both horses in the autumn next year." 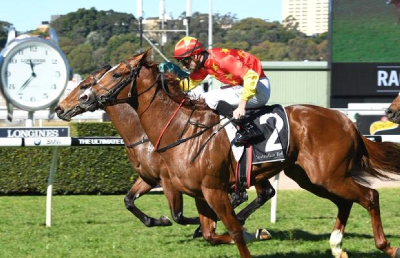 Assimilate (closest) narrowly defeated stablemate Dracarys at Randwick on Saturday.